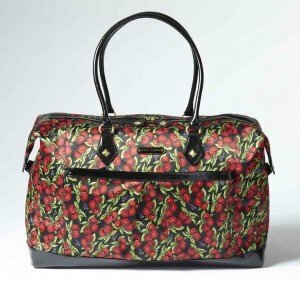 The travel range has a diverse selection for girly jetsetters, with upright rollers and wheeled duffels for extended vacations and weekender totes for quick getaways. As you might imagine from goods created by the always outrageous Miss Betsey, the classic travel styles are decorated with bold prints. The Glam Cheetah range sees Betsey Johnson's favorite animal print rendered in bold red satin. As if those wild spots weren't enough, the line's bags are also decorated with ruffled pockets. If you'd prefer something sweeter consider the Punk Cherry collection, with its striking black and red cherry print, glossy patent trim, and crystal studs. Whatever Betsey Johnson travel bag you choose, you probably won't mistake it for another on the baggage carousel! No one wants to spend a fortune on luggage before they even leave home, so I'm glad to see Betsey Johnson's kept costs down. Her travel bags start at $195 and top $420. That should leave some extra spending money in your wallet! Look for the Betsey Johnson travel bags at Dillard's and Betsey Johnson boutiques next month.